Discussion in 'DELETED POSTS' started by PaUlaRO, Aug 24, 2011. Virtua Tennis 4 (Sega Professional Tennis: Power Smash 4 in Japan) is the third sequel to Sega's tennis game franchise, Virtua Tennis. It was released on PlayStation 3, Xbox 360 and Wii, but it has also upcoming releases on PC and PlayStation Vita. 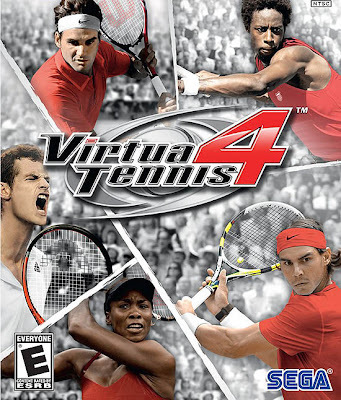 Virtua Tennis 4 is the first numbered game of the series without an arcade release. The game supports the PlayStation Move controller on the PlayStation 3, the Kinect on the Xbox 360, and the Wii MotionPlus on the Wii. All previously mentioned devices are optional. Virtua Tennis 4 allows the player to step into the shoes of some of the world's best tennis pros. The game supports stereoscopic 3D on the PlayStation 3. When the PlayStation Move is used, the character's left and right movement is automatic but each swing of the racquet must be performed by the player and one can drop back or rush to the net by physically stepping back or forward. There is a dynamic camera system in place, so when the ball is in the other half of the court, the camera pans out so that one can see one's position. When the ball is coming towards the player, it glides into a first person viewpoint where the player can see their racquet in front of him and time their swing accordingly. The player can twist the racquet to adjust its face when it connects with the ball, allowing skilled players to apply spin. where can we download all these games and with what downloader?? ?some are saying jdownloader,some flashjet,some IDM,which one pesin go use now?? ?abeg make una elaborate more on this i mean the fastest!!! the question shouldnt be where but how, cos the link is already therein. Use iwp with idm. Pm press2 or jouslaw for vps server. HAILINGS BABA @ PAULARO ME NEVA FIT DEY FLEX ALL DIS PC GAMES OOH COS D VGA IS NOT JUST COMPATIBLE FOR MY WINDOWXP SP3. AM PLANING TO CONVERT MY XP TO WINDOW7 HOPE IT WILL BE ADVICE ABLE WIT THIS P4 DESKTOP RAM:1GB HARDDISK:40GB? window 7 ultimate is the best. kk.....dnt worry it won't afterall i av downloaded 1.81 GB with my phone..